Casting Ian McKellen as Sherlock Holmes is, in and of itself, a stroke of genius. The acting thespian is more than a perfect match for Arthur Conan Doyle’s most famous creation (although within the film, it is established that it was John Watson that wrote the stories as opposed to the real-life author) and brings an old-fashioned gentlemanly vibe to the character in an age where the likes of Robert Downey Jr and especially Benedict Cumberbatch have all but defined the character for a modern audience. He’s smart, witty and powerful in the role, and is more than a perfect match for the part. Having McKellen play an aged version of Sherlock Holmes – aged 93, in fact – is also a stroke of genius. By placing the character in his twilight years, thanks to the combination of some effective make-up and McKellen’s great physical performance, allows us a new glimpse of the famed character that we haven’t truly seen before; one where not even the cleverest man in the world can escape old-age dementia and frequent memory loss that prevents him from being the magnificent man we all know. It’s a genuinely interesting new side that we’re shocked hasn’t really been explored before. As for the rest of Mr. Holmes? Eh. Not that everything outside of McKellen’s performance and the idea of an aged Holmes is bad, if anything it’s very pleasant and relaxing. But that’s part of the problem – for a film that presents such a fascinating idea with a great actor leading the way, it’s all a bit too safe and polite to truly catch up with it. We don’t necessarily expect thrills and smart by the minute as we have done in the past, but we’d prefer something that compliments both stand-out elements while being truly engaging in its own right. Here, the story just meanders and brisks along slowly, as if not much was really going on. Much of the action actually takes place in flashback, or in this case two – one sees a slightly younger Holmes attempting to solve his final case (which present Holmes is trying to write down before his memory fades away), and the other takes place slightly prior to the film’s start with Holmes visiting Japan to meet Hiroyuki Sanada’s Matsuda Umezaki. In the present, however, the main story sees Holmes trying to write said story whilst bonding with the young son of his housekeeper (Milo Parker and Laura Linney respectively) – not exactly the most intriguing of stories, especially for Sherlock Holmes. Those two flashbacks certainly present a possible series of interesting ideas, but doesn’t necessarily follow through with them or make them particularly ground-breaking. The revelation as to why the case that Holmes investigates leads to his self-imposed exile is a little underwhelming, especially with the build-up that surrounds it; it’s an idea that’s neither made entirely clear in this context nor presented in a fully compelling way. Director Bill Condon certainly knows what type of film he wants to make, especially with the prospect of an aged Sherlock Holmes, but can never quite keep it focused on what should make it so compelling – though it is nice to see him reunite with McKellen after the Oscar-nominated Gods and Monsters (and soon again in Condon’s forthcoming live-action version of Disney’s Beauty and the Beast, with McKellen as Cogsworth). It feels as though it’s catered more to the Best Exotic Marigold Hotel crowd than it is to the loyal fan base of Arthur Conan Doyle’s work, in that it presents a series of minor situations – save for a shock incident later in the film involving one of the main characters – for its elderly protagonist that are fairly safe and undemanding for them as well as the audience. It’s an understandable approach, but for an idea and lead performance as great as this you can’t help but feel it deserves more than this treatment. The two main attractions, though, are by far McKellen and the idea of an elderly Holmes. 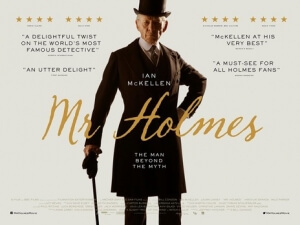 Both elements are truly fantastic and offer new and insightful ideas into the mythology of this popular character, giving Mr. Holmes a reason to be seen. Shame the rest of the film just can’t keep up with them. Mr. Holmes offers both the fascinating idea of an aged Sherlock Holmes and a truly remarkable performance by a well-cast Ian McKellen, but the rest of the film plays a bit too safe which makes it feel like pandering to its older audience rather than truly engaging them, a trait that those two elements deserve better than.